Duncraft, Inc., located in Concord, NH, was founded in 1952. 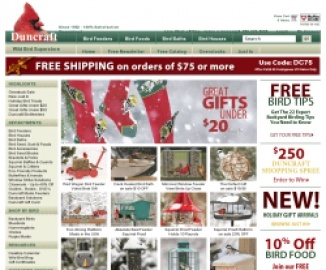 Today, the company manufactures Duncraft- brand bird feeders, mails the Duncraft Living with Nature Catalog nationwide. Click a Coupon or click Start Shopping to earn 8% Cash Back at Duncraft. Some exclusions apply. While supplies last.